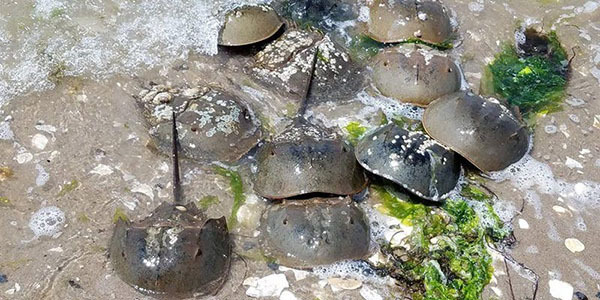 Dr. Lisa Jean Moore of SUNY Purchase, author of Catch & Release, explores the interspecies relationships between humans and horseshoe crabs – our multiple sites of entanglement and enmeshment. Humans have literally harvested the life out of horseshoe crabs for multiple purposes; we interpret them for understanding geologic time; we bleed them for biomedical applications; we eat them as delicacies; we rescue them for conservation; we capture them as bait; and we categorize them as endangered after having once collected them for agricultural fertilizer. On the other hand, the crabs make humans matter by revealing our species vulnerability to endotoxins, offering career opportunities, profiting off of crab bodies, and fertilizing the soil of agricultural harvest for human food. Dr. Moore’s lecture will be introduced by Dr. Elizabeth Albert of St. John’s University and author of Silent Beaches: Untold Stories of New York City’s Forgotten Waterfront; and by Matt Malina, Founder and Director of NYC H2O, our frequent collaborator for events and lectures. This lecture is free and open to the public, but we ask that you RSVP at the Eventbrite page for the lecture.